It's been a long time since Nik Nerburn last rode his bike up Paul Bunyan Drive, past the hefty concrete Paul and Babe statues to hang out with teenage friends at the Paul Bunyan Mall. But Paul never left his mind. Nerburn's first school was Paul Bunyan Elementary in Bemidji. His first assignment there was to draw a picture of Paul Bunyan. "And then a big guy came in dressed like Paul Bunyan and told us all Paul Bunyan stories," Nerburn recalled. "I'm steeped in it." Nerburn grew up in Bemidji the son of well-known author Kent Nerburn and Louise Mengelkoch, who taught journalism at Bemidji State University for 24 years. He left a decade ago, but returned to his hometown Saturday to finish a documentary on the hulking figure that dominated his childhood. Nerburn, 25, considers himself a punk documentary film maker. He shoots everything on ancient 16-millimeter film and shows his work at art houses. A year ago, he set out from his San Francisco home in an abandoned fortune cookie factory to travel across the country collecting dusty reels of archived film and digging up 16-millimeter bits of the Bunyan legend. Recently a $3,500 Kickstarter plea funded the final stages of production. Bemidji was one of Nerburn's last stops. "I figured it was time to finish the dang film," he said, reaching for his 50-year-old Bolex camera from the back of a rental car. He was planning a few final shots north of town, but took a spur of the moment walk down the streets he ran on as a child, under the towering concrete Paul. One of the many Bunyan likenesses around the country stands tall on the western shore of Lake Bemidji. 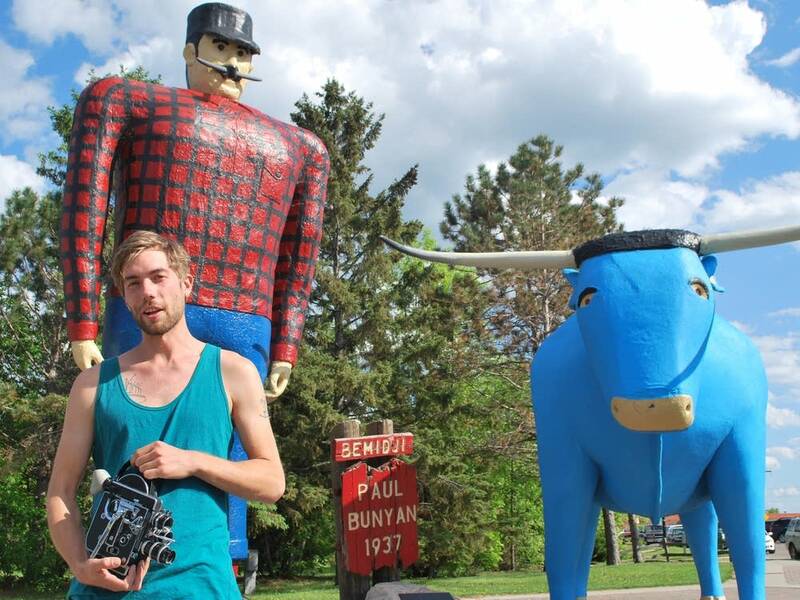 "Paul Bunyan is everywhere in Bemidji," Nerburn said. "I didn't even realize that was weird until I left." Bunyan and Nerburn have a complicated relationship. As a punk documentarian, Nerburn hopes to challenge racism, capitalism and patriarchy. "To me," he said, "Paul sort of stands for all those things." 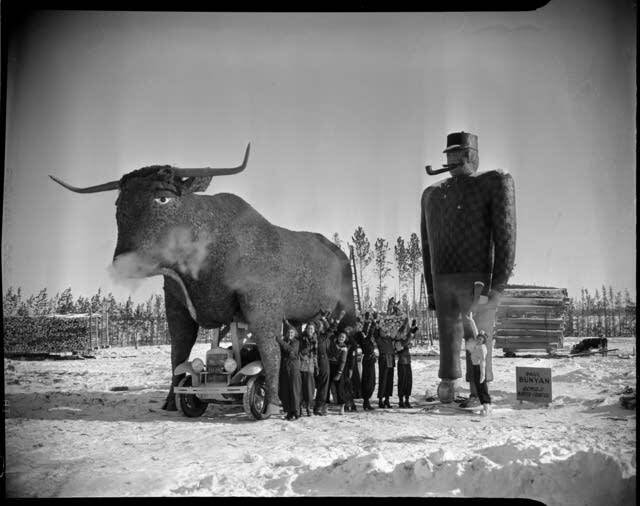 Paul Bunyan is generally thought to be the 1922 creation of William Laughead. 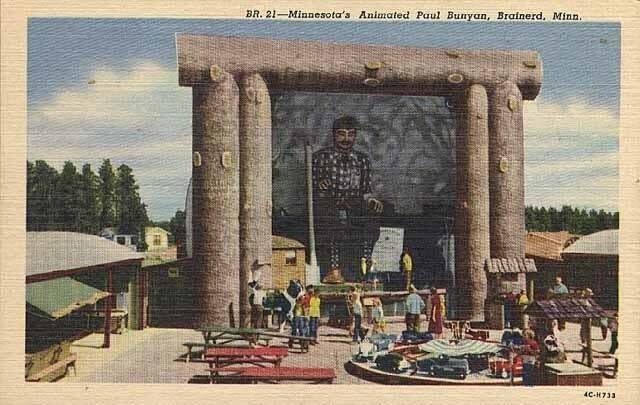 The axe-wielding, pancake-demolishing plaid-clad giant was a marketing tool for the Minnesota-based Red River Logging Company. At a time when Minnesota loggers were running low on local wood sources, they started bringing in lumber cut in California. Paul Bunyan was an attempt to win over the Midwest market. The statues started springing up across the country near the end of the Great Depression and in 1937 Bemidji got its statue. Nerburn didn't pay too much attention to Paul as a child. But somewhere along the line, Nerburn started thinking of the giant as a sort of spokesman for the expansion of the white man into native lands, the consumption of natural resources and glorification of traditional blue-collar masculinity. "How much more blatant can you get? A dude wearing flannel with his beast of burden staring out over the city he's built," he said. "If you know anything about colonial history or Native American displacement it doesn't really set well with you." Nerburn said he initially wanted to take on Paul to get all the statues ripped down. But that changed when he started working on the documentary. 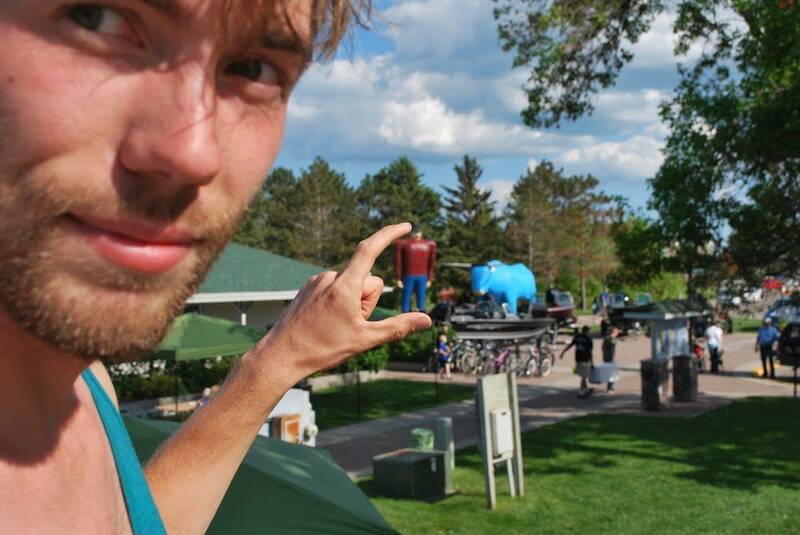 As he traveled all over the West Coast and into the Midwest to film scores of Paul Bunyan statues his view of Paul softened a bit. As he works to finish his documentary, Nerburn no longer wants to topple any statues. Near the end of a documentary rough cut, his voiceover suggests there's a difference between history and heritage. 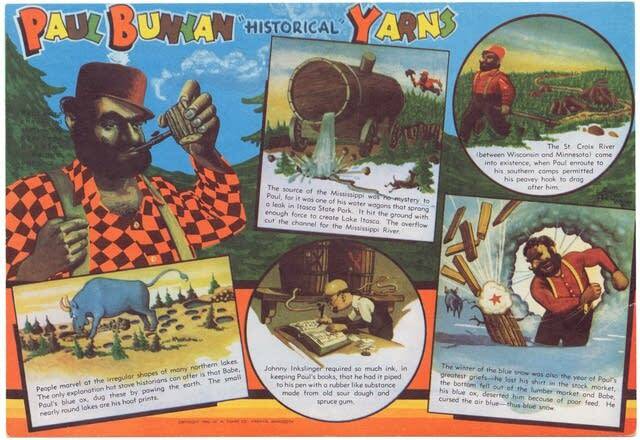 Paul Bunyan is simply heritage. "People love Paul," he said. "As well they should." Now his goal is simply to "complicate" Paul Bunyan. At the foot of Bemidji's giant statue, Nerburn squinted up through the sun at Paul's thick face, robust mustache and tobacco pipe. "I should have brought my pipe," he said, "to match." The Northern Spark Art Festival picked up some of Nerburn's work. His video, "In the Shadow of Paul Bunyan" will be projected on the wall of the Cowles Center for Dance and Performing Arts Saturday in Minneapolis. For more information visit the Northern Spark website.